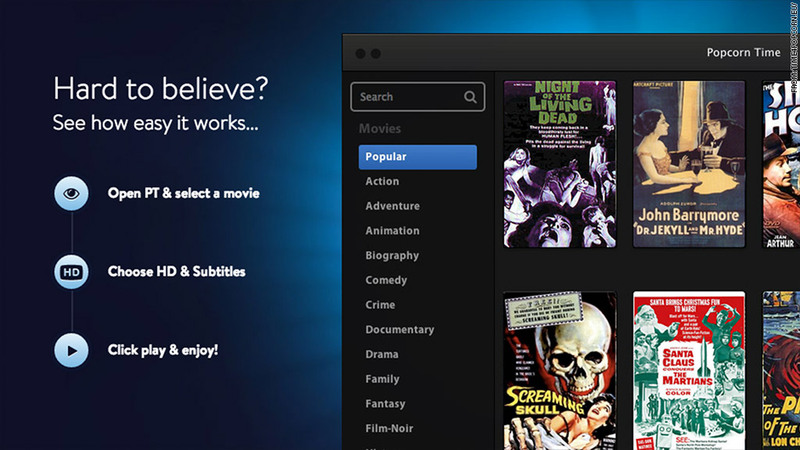 Popcorn Time says its encrypts traffic to make sure users can view pirated movies anonymously. Pirated movies are coming to Google Chromecast. Popcorn Time, a streaming service for pirated movies, announced Sunday that its software is now Chromecast-compatible for Windows users. A Chromecast-ready update is also in the works for Mac users, Popcorn Time said. Chromecast is Google's $35 streaming device, which sends video from your Chrome browser or from services like Netflix and YouTube to your television. Google announced a series of pending updates for Chromecast last month, including the ability to mirror anything on an Android phone or tablet on your TV. Popcorn Time, an open-source project launched earlier this year, has gained popularity thanks to its simple interface and its commitment to covering users' digital tracks. Google (GOOGL) did not immediately respond to a request for comment Monday, but it's safe to say the company won't be thrilled with this development -- Popcorn Time says it was removed from the Google Play store within 24 hours of its debut there in May.